Sidewinder is a name many know, especially those who are fond of techno-war novels, because under this term is called a missile of the US Air Force, capable to detect and follow a target thanks to the emission of heat. However, the name the technicians have given to the weapon has been snatched to an animal and, on the other hand, how many inventions, ancient and modern, have has the nature as inspiring muse? They are many, by sure. Actually, the sidewinder is a rattler of the American desertic and sub-desertic zones, and the name comes from the way of locomotion it uses on the sandy, soft grounds and on the dunes, where the reptilian goes ahead by moving laterally and leaving unmistakable traces. This side-moving is not, in fact, an exclusive characteristic of desert species: also serpents living in muddy environments, such as the dog-faced water snake (Cerberus rhynchops), the Sea-leopard snake (Enhydris bocourti), the Rainbow water snake (Enhydris enhydris) and other marshy Asian colubrids, adopt such way of proceeding on treacherous and yielding substrata. This “gait” consists in lateral undulations of the body in such a way that the head is projected ahead, followed by the body, which is “thrown” further ahead: the result is the lateral advancing, angled with respect to the direction of the body of the reptilian and the traces left behind resemble to some J letters placed in a parallel manner. But the characteristic which has inspired the creator of the missiles is another, and is common to all the pit vipers, practically those venomous serpents that, once, were called crotalids: the presence of the thermo-receptor dimples which allow the reptilian to localize warm-blooded preys also without the help of the sight, something similar to what the missile does with the enemy jets. 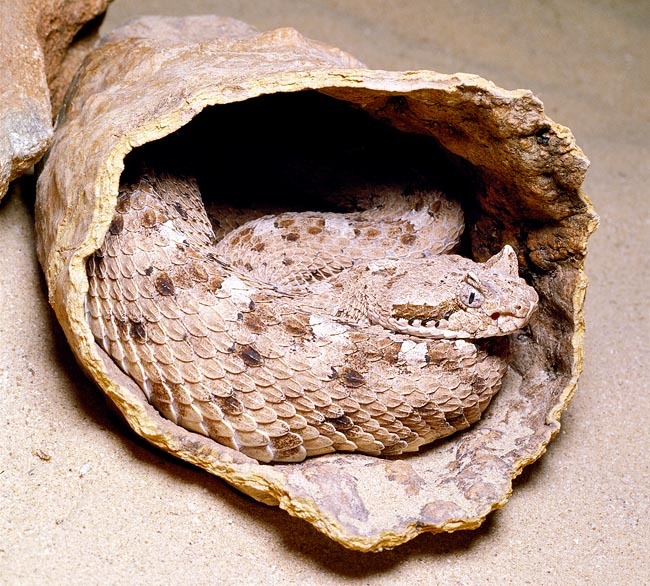 The additional name “ceraste” refers to the remarkable resemblance, physical, of habits, of locomotion and of habitat, with the Sahara horned vipers (please refer to the text about Cerastes cerastes ) and African and Asian pseudo-cerastes, vipers in the strict sense, therefore not provided with “dimples”. One might conclude, therefore, that cerastes and sidewinders have occupied much similar ecological niches in different continents, something like what happens for many other species, for instance, in the world of the birds, with the American hummingbirds and the African nectarinids. Going back to the sidewinder (Crotalus cerastes Hallowell, 1854), known in English also as Horned rattlesnake, in Italian as Crotalo cornuto, Crotalo della sabbia o Crotalo ceraste, in Spanish as Crotalo cornudo and in German as Seitenwinder, it is, finally, a Viperid (Viperidae), belonging to the subfamily of the Crotalines (Crotalinae), the rattlesnakes. The males measure, as an average, 60-80 cm whilst the females are a little bigger. The head is flattened and triangular, rather wide if compared to the neck, which is thin, whilst the body is robust, so that it seems almost that there is a sort of a constriction at the level of the passage head-body. Like in the other rattlesnakes, the slit-eye has a vertical pupil, and is placed fairly high, just under the two protuberances similar to small horns which have, possibly, the duty to act as sunscreens, which strongly characterize the animal and which are modified scales. This positioning is to be related with the habit (common to many sand vipers), to bury, by digging with almost vibratory movements into the sand itself, leaving out only the eyes and the upper part of the head. This habit has not only the charge of camouflaging as protection from the predators and of ambush hunting, but also of giving a shelter to the reptilian from the extreme heat which, in the animals not endowed with an advanced system of thermoregulation, may reveal even more dangerous than the cold. On the lateral side of the head which, as we shall see, is of a pale colour as, anyway, the rest of the body, stands a darker stria, usually of dark beige, grey or brown colour, which starts from the back side of the eye, whilst the thermo-receptor dimples are placed at a lower level of the eye itself, just over the lip: as a matter of fact, the typical positioning, when the animal is “silted”, is with the snout slightly turned upwards, n such a way that the dimples may accomplish their duty. The body is robust, covered by keeled scales which greatly help it when progressing on highly unstable and land sliding soils, the colour is usually clear, from cream to ash grey, passing, in some individuals, through a pale reddish or pale brown. On the livery stand out darker dots, small at times, at times bigger, but which, anyway leave uncovered vast zones of the background colour. In some very clear specimens, these dots may be so much faded to result, at a first glance, as almost non-existent. The tail is short and thin and has the typical “rattle” that, when quickly vibrating, generates a sound similar to a buzzing. These viperids live long, 25-28 years as an average, even 30 when in captivity and tend to perform “migrations” in the range area where they do live, depending on the environment conditions, which may vary during the year. As shelter, they utilize cracks and fissures of the rocks, bush and holes, at times dens dug by other animals, which may share with serpents of other species, and tend to be crepuscular and nocturnal. When the climate is too cold (the optimal temperature being around the 30 degrees) they may “hibernate”, because low temperatures render sluggish their movements and impair the digestion of the preys. The hunting is carried out by ambush, relying on the motionlessness, on the camouflaging and on the silting technique. The main preys are small rodents and lizards, which are quickly killed by the venom, cytotoxic and haemorrhaging, and which act also as a sort of outer gastric juice beginning, practically, to “digest” the prey when it has not yet been swallowed, thus easing and quickening the process which will take place in the digestive tract of the serpent. 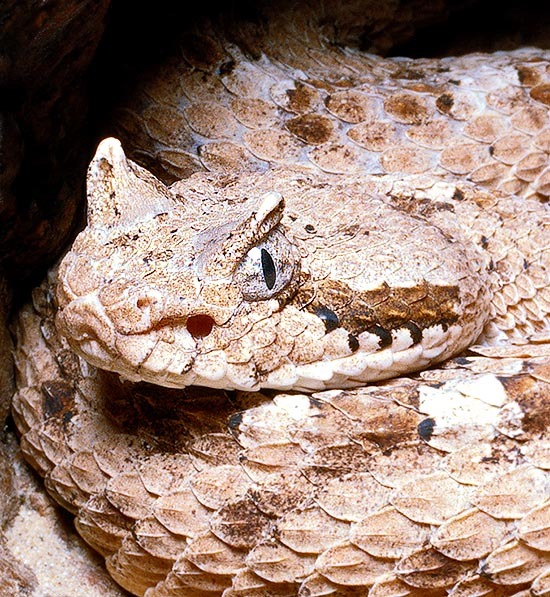 The venom of the horned rattlesnake is not particularly powerful, and is not even excreted in big amounts, so, usually it is not lethal for an adult and in good health human, but a bite is, however, dangerous and very painful, and can lead to necrosis and gangrenes, with, at times, the loss of a finger or of a hand. The technique of poisoning varies depending on the prey: small mammals, such as the kangaroo-rats (Dipodomys) or the pocket mice (Chaetodipus), are bitten and then released, and later on the serpent localizes them by utilizing the bifid tongue and the Jacobson organ, whilst lizards or small snakes are held after the bite, perhaps because they should be more difficult to find or for the possibility they hide in too narrow holes to enter for the hunter, but also because a rodent, being equipped with cutting nails and teeth, might hurt the rattlesnake while trying to defend itself. The sidewinder is ovoviviparous, and the female “delivers” alive youngs. Usually, the matings take place between April and May, or, in some zones, in autumn. The female couples and delivers not more than once a year, but often, if the zone is poor of preys, every two or three years. The coupling is complicated and laboured. The male “slides” the body and the head along the back of the female for stimulating her, and, if this one consents, twists its tail to that of the partner, trying to bring closer the relevant cloacae for fecundating it and the process may last hours, during which if one of the partners decides to move, it will simply carry the other together. The births happen, usually, in late summer or in autumn and the number of the newborns, long, upon the birth, from 15 to 20 cm, varies from 15 to 18 and the “delivery” requires two or three hours. As soon as off from the transparent membrane wrapping them, the youngs, already self-sufficient, remain near the place where they were born for a few days (two or three, as an average), and then go away everyone about its business, scattering in different directions. As mentioned, the habitat s formed by zones often desertic and sandy, with presence of rocks, which offer shelter and protection, up to altitudes not exceeding the 1600 above sea level, the distribution range includes the south-eastern part of California, the Mojave and Sonora deserts, western Arizona, and the southern part of Nevada and Utah. → For general notions about Serpentes please click here. → To appreciate the biodiversity within the SNAKES please click here.